• Newsmaker – As the Ice Bucket Challenge went viral and swept the US, Carrie Munk, chief communications and marketing officer for the ALS Association, kept cool to lead PR around a seismic social media fundraising effort. • The Power 50 – In an era of transparency, real-time content, and myriad opportunities and challenges, these 50 game changers are redefining the role of comms and marketing and elevating their brands and agencies to the highest levels on a global scale. 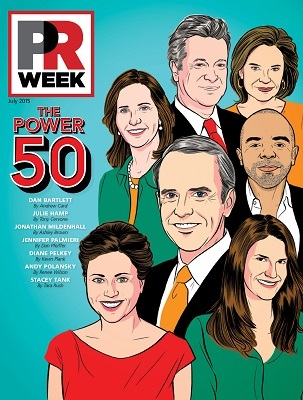 PRWeek enlists peers, colleagues, friends, and mentors to explain what makes these people so powerful. FleishmanHillard debate the issues at Washington, DC's National Press Club. • CEO Q&A – Lindsay Sparks, Sysomos, speaks about the company’s plans after separating from Marketwired earlier this year. • Market mindset: Kansas City – Joshua Brewster, account group VP at Trozzolo Communications Group, says the city has rallied to keep Millennials and Generation Xers in town and while prospective hires across specialties are plentiful, companies have to act fast. • JQ&A – The Onion’s president Mike McAvoy talks about constantly evolving to keep ahead of the real-life news outlets the brand makes fun of.